Oni wa soto, fuku wa uchi, “Out with the Devil and in with the luck” is the traditional cry of Setsubun in Japan. 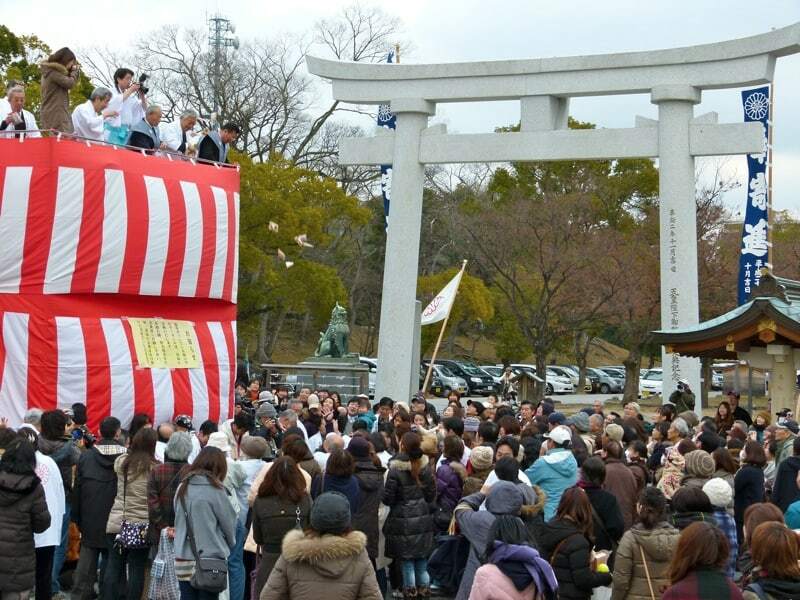 I was a bit surprised at the Gokoku-jinja Shrine Setsubun-sai event that there was absolutely no oni to be found running around scaring kids as they do in schools across the nation on this day. However, I was soon won over by the fun and interesting festivities . It started with a ceremony filled with traditional shrine behavior in the main shrine building. There was praying, religious chanting, a steady pulse of drums and much ceremonial bowing. The priest then blessed (purified) the offerings by doing o-harai passing a stick with many fluttering strands of crumpled white paper over donations on the altar and then over the crowd. I had also witnessed a couple having their new car blessed in the same way by a priest in the shrine parking lot on my way in. It is common to visit a shrine for this kind of blessing for a variety of situations for yourself, family or things that are important in your life. Once the ceremony was over, the priests scattered some beans out the front door onto the steps while shouting “Oni wa soto” (Devil- stay out!) Many children then scrambled trying to collect and eat these until their mothers told them mada mada, “not yet”, as there were many more (wrapped) beans to come. Soon after this, the head priest came out to perform kyudo– the Japanese art of archery. At first he did a bit of posing for the eager onlookers. This style of archery is different from what you might see in other countries, kyudo is considered a type of meditation and the emphasis is on gaining an empty mind, not only about the result on the target. 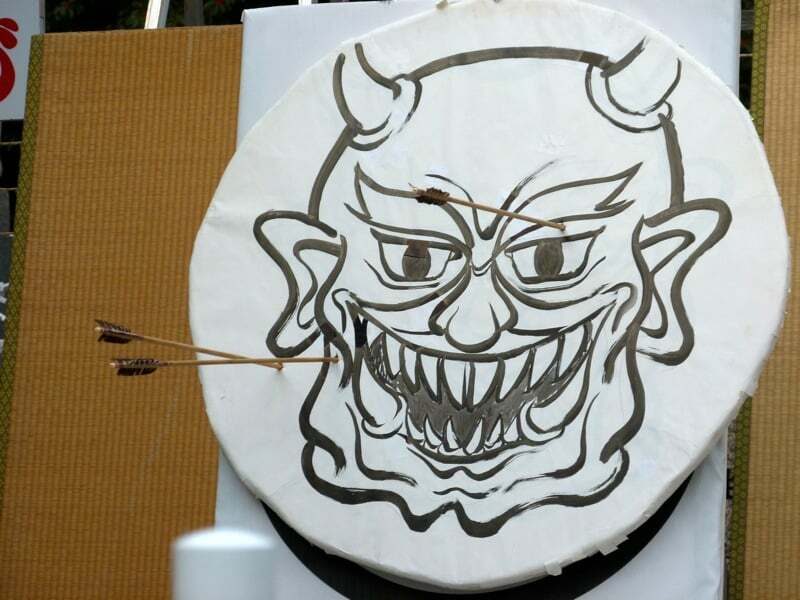 In the demonstration, the priest pointed the large bow and arrow to the sky, the ground and then shot a target painted with the Oni demon’s face. After each shot, the crowd ooo-ed and aaah-ed and then applauded very appreciatively. After the archery, the priests and some special guests to the shrine from the community climbed the stairs up to the white and red striped tower to begin the long-awaited lucky bean toss. They held three sessions of throwing beans out to the crowd. The first was open to everyone, the second was only for children (Junior High School age and under) and included some kids toys as well as beans, and the third was again for the general crowd. It was fun to be in the crowd swaying along with the many people leaning to and fro to catch the bags of beans being tossed down. Apparently some of the bags had special coupons on them that could then be redeemed for lucky charms at the shrine’s shop. I only saw the ordinary bags of beans and that seemed to make people more than happy enough. At the end of the toss, I wandered around watching many happy people posing for photographs with their bags of bean treasure they had caught- everyone seemed very pleased. As I was enjoying the event as a spectator more that an active participant, I didn’t actually catch any beans myself. But one landed near me and a kind young woman handed it to me saying, “you should really have at least one!” It was very sweet and appreciated. Walking away from the shrine, the atmosphere reminded me a bit of post-Halloween in the states as many people (especially kids) were walking along comparing their treasure, and talking about the best places they were able to catch the most- already making strategic plans for the next year. The overall feel of the event was fun, interesting, exciting and friendly. I would highly recommend it if you are in Hiroshima city next year on February 3rd.